Editor’s Note: This is Part 2 of a 3 part series on using our favorite Mac tools for keeping a commonplace book. You can check out Part 1 here and Part 3 right here. A commonplace book is a central resource or depository for ideas, quotes, anecdotes, observations, and information you come across during your life and didactic pursuits. But where Ryan and others keep this resource in paper form, as Mac users, we wanted to cover how to put this together using the incredible software available to us. And our weapon of choice is Day One. Choosing the right tools can be daunting — there are so many good choices across macOS and iOS. Indeed, our own Shawn Blanc uses Ulysses in a similar fashion to a commonplace book, and there are other good options for attempting to meet this need (Markdown text files, Sublime Text, and tags in macOS are tempting). But, Day One feels like the best choice for several reasons. First, it’s a journal, so all the entries are time-based. This approach fits the commonplace book idea as we often find ourselves recalling a particularly well-turned phrase in an article or book we read. If you want to find that phrase to quote or re-read, we often have a vague recollection of when we first came across it (“I read that book two years ago” would be the idea). 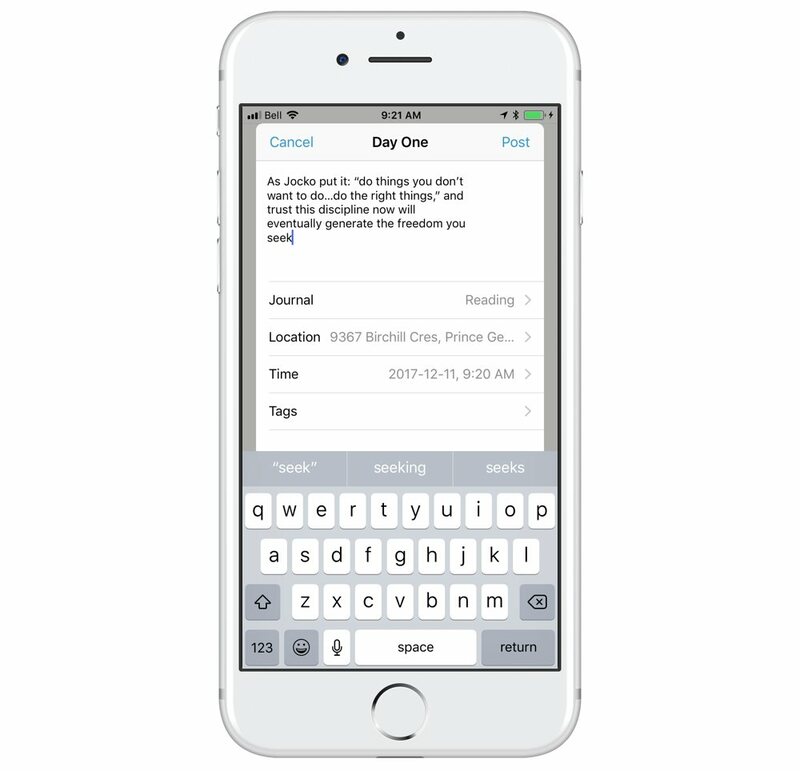 Second, Day One supports tags, so themes are well-supported and easy to search at any time and across time, thanks to the journal concept. 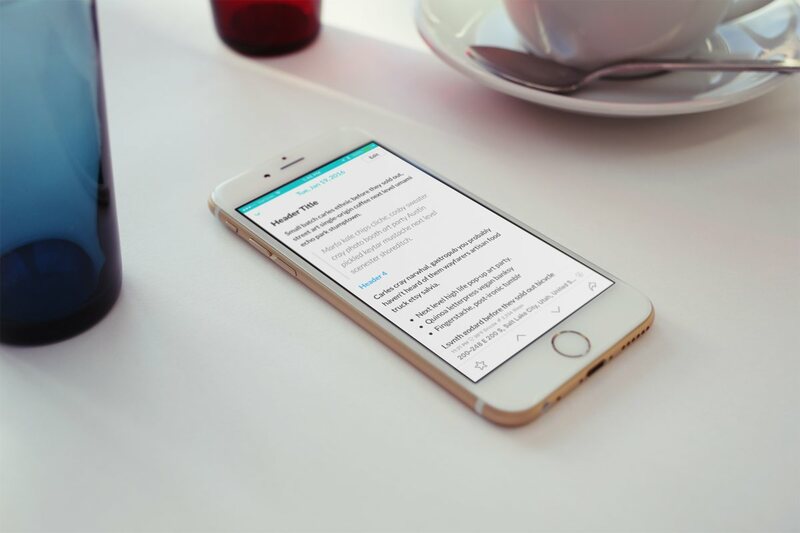 Want to find all the bits of text that relate to the perfect morning routine? No problem, thanks to your rigorous use of tags! Similar to tags, Day One supports multiple journals, so while I also use it to capture all the lovely moments of my children’s lives, I can keep my favorite bits of writing in a separate journal. Lastly, Day One has a robust API and is accessible via services like IFTTT, and that is a key to the whole thing. We can get all these lovely words into our digital commonplace book automatically. No work required on our part! Day One stands out as the best product for our purpose for several good reasons. Once we’ve decided on that, we now have to decide what we want to get in there and how we’re going to get it in. The most critical piece of our commonplace book will be the good quotes from the articles we read on the web. As so many of us spend our work and personal lives online, it’s inevitable that we do most of our reading there (that’s why we’re making a digital commonplace book), and a lot of those words come to us on one website or another. However, that does not mean we do all our reading on websites. Let’s cover the most common ways we can add content to our commonplace book. 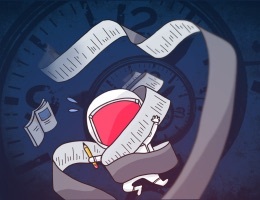 Ever since Marco Arment first launched Instapaper, the concept of read-it-later services caught on. Many folks have a bit of a triage process, where we find new content on Twitter, RSS, Medium, and other similar services. We skim through our feeds, and when something catches our eye, we add it to Instapaper or Pocket to read later. When it comes to reading on these services, getting content into Day One is well-covered. My workflow involves Instapaper and IFTTT. 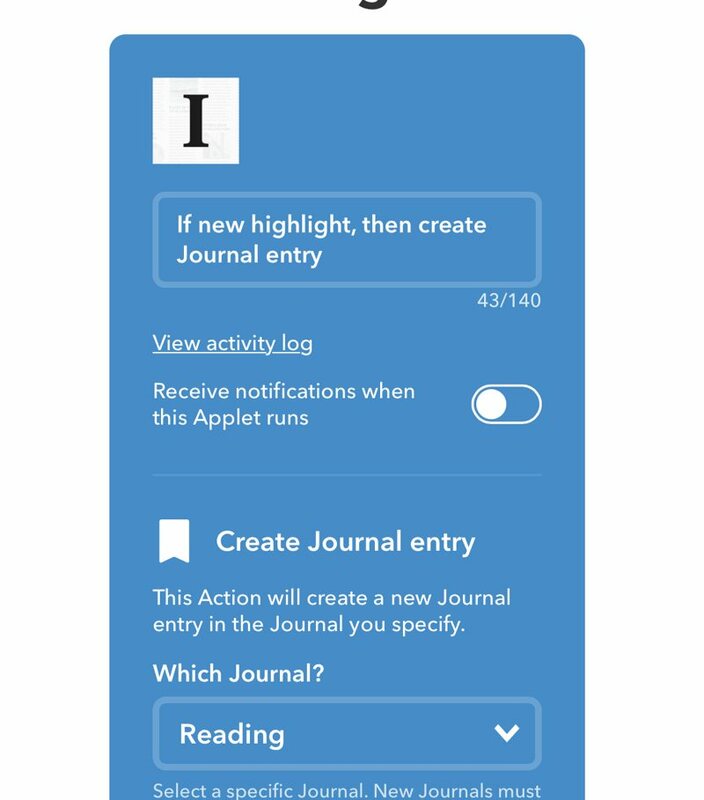 Anytime I highlight a selection of text in Instapaper, I have an IFTTT applet that takes that quote and adds it to my Reading journal in Day One. This is a wonderful workflow as you don’t have to switch away from reading to process anything. You just highlight the text and continue on while the connected services ensure the words you enjoy are available later. 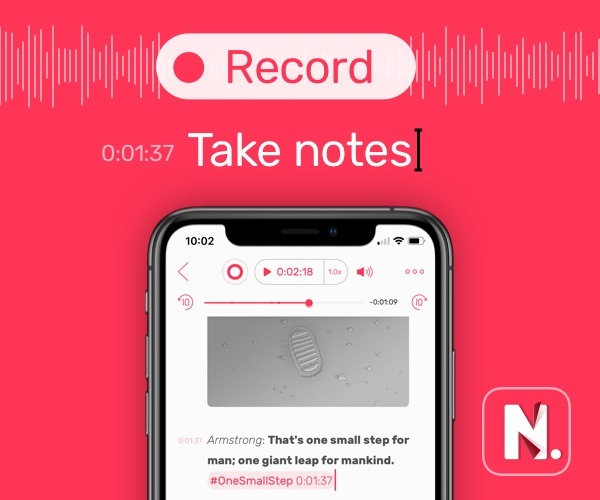 Other read-it-later services like Pocket do not necessarily support highlighting. This is one primary reason why Instapaper is the recommended read-it-later service on The Sweet Setup. In the same vein, highlights have been one of the primary features of Medium since day one (sorry, not sorry). Sadly, they do not allow highlights to be accessed via their API, so it’s not available as a trigger in IFTTT. For services like Pocket and Medium, your best bet to get content into Day One is the next option. You might be the kind of person who wants to do your reading right where you find your content. If you’re not a user of read-it-later services, then the tools built into the operating system can also help. 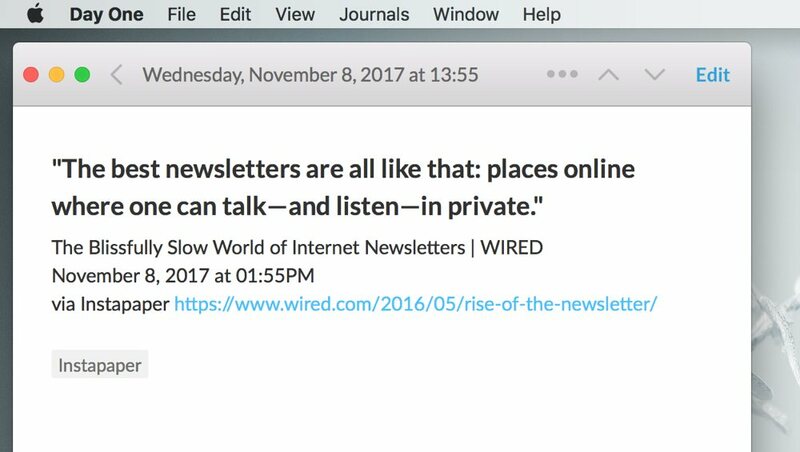 For macOS and iOS users, Safari’s share extension can include Day One as an option, and it can be included in the share extension of non-native browsers or your RSS reader of choice. Of course, every time you find a well-turned phrase, you could manually copy and paste it into Day One, but that’s a bit of friction that we can live without. The methods above should help! One other important format to consider is e-books. Anyone who has experience with e-books can likely tell you that getting content (your notes or highlights) out of their e-book reader service is not easy. The top two options for Apple users, iBooks and Kindle Reader, are both very lacking in this regard. E-book ecosystems appear to have been designed without transparency in mind. Apple, Amazon, and other services want to keep you and your highlights nice and tightly locked up in their services. iBooks doesn’t even include a way to see your highlights from the books you’ve read — they’re only available when reading the book itself. Amazon at least provides a web-accessible service that lets you see your highlights across your library (and it received a pleasing refresh in 2017), but you cannot share those highlights. As for getting highlights into our commonplace book, the options are limited. There is one service that offers some hope: Clippings.io. It’s Kindle-only, but it does give you a way to get those items into other services. One thing that should be noted here is bookmarks. I would not recommend using this commonplace book to store all the websites you care about. Day One is not the best option or format for storing an extensive collection of links. Our recommend usage here is for words themselves. When we save a collection of words, whether one sentence or several paragraphs, we do want to save the source along with them, but storing all the web pages that catch your interest is better done in Pinboard or a similar service. In Part III of this series, we’ll talk about how to get the content from your physical books into your digital commonplace book.